A small space for a whole lot of sport! Countless futsal, cricket and soccer clubs and members of the Glen Eira community will use the facility for many years to come. Moorleigh Reserve in the City of Glen Eira is used by local sporting clubs and members of the broader community. When this older facility required upgrading, a new design created multipurpose cricket nets and futsal play area in an area of only 600m2. With larger than usual draw curtains the facility can quickly and easily transform from a fully enclosed futsal/soccer facility to cricket nets, to meet the needs of the community. The superior 9mm synthetic grass surface is especially designed for use in cricket. A strong, reliable pitch designed to stand the test of time promoting medium pace and bounce. 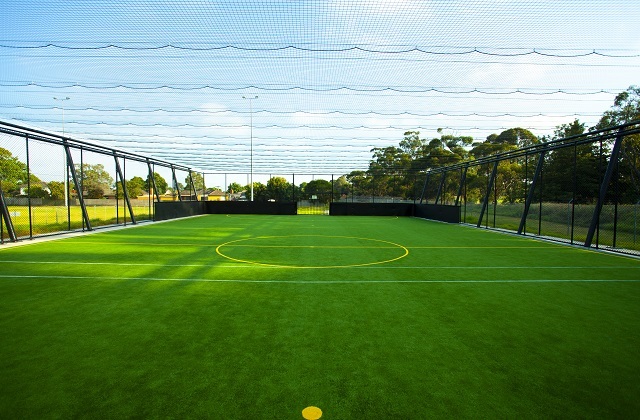 This Australian made surface will also prove a durable and even paced surface for futsal and soccer. To support the large cricket nets a massive 186m3 concrete was used in the in 1 metre footings alone and a further 96m3 for the sub-base itself.